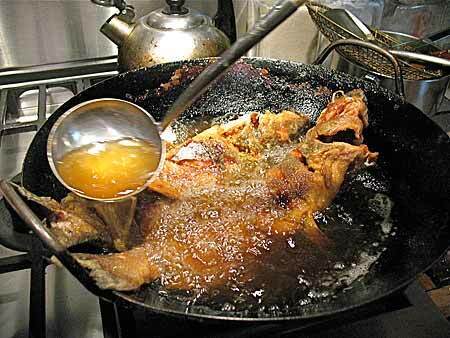 Here you see two whole catfish being fried in Kasma's 16" carbon steel round-bottomed wok. Kasma is using a ladle to pour hot oil on the top of the fish to help cook it crispy. The recipe is for (Southern) Crispy Fried Turmeric Catfish with Dipping Sauce (Bplah Doog Tawd Kamin) and is taught in evening Series Set A (class 3).